Happy Holidays from Haight. If you visit this page before playing the holiday ecard we sent you, click here and press “►” and then feel free to return to this page to view our 2017 Acts of Kindness. Haight wishes everyone a happy and safe holiday season! 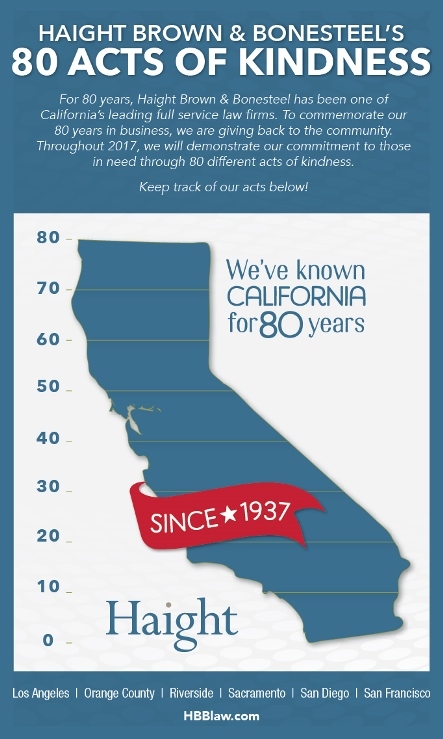 As part of Haight’s 80th Anniversary, the firm made a commitment to perform a minimum of 80 Acts of Kindness which will benefit various organizations and causes near and dear to the hearts of our Firm as a whole and individual professional team members. What started as a Firm initiative for our 80th anniversary has morphed into a campaign which combines our Firm efforts with a great many of our professional staff team members who have invested their own time, energy and effort into the campaign by committing random acts of kindness for people they encounter during their daily travels past street corners, at subway stations and various locations throughout the state. They range from small acts such as donating money and food to those less fortunate to sponsoring participants in various walks and cycling events that benefit worthwhile organizations such as AIDS/Lifecycle and the Susan G. Komen Race for the Cure. Some of our attorneys also provide pro bono legal services to organizations benefitting women and children in need and members of the armed services to name a few. Haight’s 80 Acts of Kindness are tracked via the links below which document the various acts of our multiple offices and professional team members which all count toward our overall number of acts that will be completed in 2017. View Haight’s Schoolhouse Schedule here. If you’d like to attend any of our schoolhouses, please contact Lisa Muzycka to reserve a spot. Space is limited.